A record number of reenactors are going to participate in the 2015 historical reenactment of the 1444 Battle of Varna in Eastern Bulgaria which ended the second Crusade of the King of Poland and Hungary Vladislav (Wladyslaw) III Jagello, also known as Varnenchik (Warnenczyk), against the Ottoman Turkish Empire. Vladislav (Wladyslaw) III Jagello, also known as Varnenchik (Warnenczyk), King of Poland and Hungary, was King of Poland in 1434-1444, and King of Hungary and Croatia in 1440-1444. He launched two ultimately unsuccessful Crusades against the Ottomans: in 1443 AD, reaching Sofia before retreating for the winter, and 1444 AD reaching the Black Sea city of Varna where he perished at the age of 20 in the Battle of Varna against the forces of Ottoman Sultan Murad II (r. 1421-1451 AD). 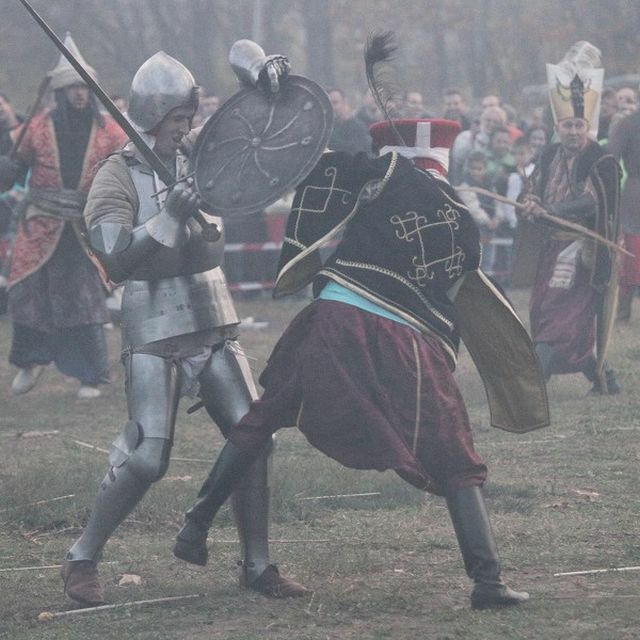 The historical reenactment of the Battle of Varna on the 571th year since it took place is to be held on November 14, 2015, at 3:30 pm, at the Asparuhov Park in the Asparuhovo Quarter of Bulgaria’s Varna. The reenactment entitled “The Last Battle of the King" is organized for the eighth year in a row by the Chigot Association, reports BTA. In addition to the participants from Bulgaria and Serbia, for the first time the reenactment of the 1444 Battle of Varna will feature reenactors from Romania and Turkey. The 2015 reenactment is also expected to be the largest ever, with more than 80 participants joining in. The organizers from “Chigot” point out that the 1444 Battle of Varna was one of the most important military battles in the history of the Balkan Peninsula because its outcome doomed Bulgaria and all of Southeast Europe to remain part of the Ottoman Empire, a period known as the Ottoman Yoke, for centuries to come. The reenactment on the 571st year since the Battle of Varna is sponsored by Varna Municipality, and the Varna District Administration. Bulgaria’s Black Sea city of Varna has a memorial complex dedicated to the Battle of Varna in 1444 AD, and the heroism of the Polish King, known as the Vladislav Varnenchik Museum Park. The Museum was first opened on the site of the Battle of Varna as a mausoleum in 1935, and then turned into a park museum with an area of 30 decares (app. 7.5 acres) in 1964, on the occasion of the 520th Year since the Battle of Varna. Varna is also going to have a monument of Vladislav Varnenchik in the city (the museum park is located outside the site, on the actual site of the 1444 Battle of Varna). The monument is to be erected at the initiative of the Bulgarian Cultural Institute in Warsaw, Poland, and has been donated by renowned Polish sculptor Prof. Marian Konieczny from Krakow. The bravery, sacrifice and tragic end of Polish and Hungarian King Vladislav (Wladyslaw) Varnenchik, whose warriors included Poles, Hungarians, Czechs, Slovaks, Wallachians, Ruthenes (Rusyns), Bulgarians, Croatians, Saxons, Lithuanians, and Crusader Knights of Pope Eugene IV (r. 1431-1477), affected the fate of all of Central and Eastern Europe, and made him a hero in the folklore of many European nations, Bulgaria included. The Battle of Varna occurred on November 10, 1444, near the Bulgarian Black Sea city of Varna. In it, the forces of Ottoman Turkish Sultan Murad II (r. 1421-1451 AD) defeated the Christian Crusade of the King of Poland and Hungary Vladislav (Wladyslaw) III Jagello. He launched two ultimately unsuccessful Crusades against the Ottomans: in 1443 AD, reaching Sofia before retreating for the winter, and 1444 AD reaching the Black Sea city of Varna where he perished at the age of 20 in the Battle of Varna against the forces of Ottoman Sultan Murad II (r. 1421-1451 AD). Because of that, in Bulgaria the heroic Polish and Hungarian King is known as Vladislav Varnenchik (Wladyslaw Warnenczyk), i.e. Vladislav of Varna. The Second Bulgarian Empire (1185-1396) was conquered by the Ottoman Turks in 1396 (although some Bulgarian estates in the west may have survived for а few more decades). In 1396 AD, Hungarian King Sigismund of Luxembourg (r. 1387-1437 AD, later Holy Roman Emperor in 1433-1437 AD), organized a crusade against the Ottoman Turks which, however, ended in a disaster for the Christian forces in the Battle of Nicopolis (today’s Bulgarian town of Nikopol). The Crusades of the Polish and Hungarian King Vladislav (Wladyslaw) III Varnenchik were the last Christian campaign against the Ottoman Empire in the Late Middle Ages that had the potential to liberate Bulgaria. With its failure, Bulgaria remained suffering for centuries, a horrific period known as the Ottoman Yoke, and was liberated only in the Russian-Turkish War of 1877-1878. During his campaign against the Ottoman Empire in 1444, King Vladislav (Wladyslaw) III Jagello was in charge of an army of some 20,000 European Christian warriors, including Poles, Hungarians, Czechs, Slovaks, Wallachians, Ruthenes (Rusyns), Bulgarians, Croatians, Saxons, Lithuanians, and Crusader Knights of Pope Eugene IV (r. 1431-1477). The young Vladislav (Wladislaw) III Jagello inherited his father King Wladyslaw II Jagello as the King of Poland in 1434, at the age of 10. In 1440, Vladislav became also the King of Hungary, after a union between the Kingdoms of Poland and Hungary designed to unite their forces against the Ottoman Turks. After the first Crusade of King Vladislav and John Hunyadi against the Ottoman Empire, which reached Sofia in the fall of 1443, the Ottoman Sultan Murad II signed a 10-year truce with Hungary, and in August 1444 resigned from the throne in favor of his 12-year-old son Mehmed II (who later became Mehmed II the Conqueror after conquering Constantinople in 1453 AD). The new Crusade was organized under the auspices of Pope Eugene IV in anticipation of a new Ottoman invasion. The preemptive Christian campaign that later became known in history literature as the Varna Crusade led the old Sultan Murad II to return to the throne. Before reaching Varna on the Black Sea coast, the Crusaders advanced along the Danube in Northern Bulgaria, with Bulgarian rebels led by Fruzhin, the heir to the Bulgarian throne in Tarnovgrad (Veliko Tarnovo), son of Tsar Ivan Shishman (r. 1371-1395), joining along the way. On November 9, 1444, the Ottoman army which was at least 50,000-strong approached Varna from the west catching the Christian forces between the Black Sea, the Varna Lake, and the Frangen Plateau. Thus, in the Battle of Varna, on November 10, 1444, the European Christian army led by King Vladislav Varnenchik, the Transylvanian voivode John Hunyadi, and Mircea II of Wallachia was outnumbered roughly three to one by the forces of Ottoman Sultan Murad II. The two armies faced one another on a front of about 3.5 km. In the rear of the Christian army, the Czech Hussites formed a wagon fort (Wagenburg) armed with bombards. The brave Polish and Hungarian King perished in the midst of the battle when he led a charge of his personal guard of 500 knights against the 10,000 Janissaries of the Ottoman Sultan in an attempt to capture Murad II. Breaching the last lines of the Janissaries, the King was murdered after his horse tripped, and he fell on the ground. The loss of the King’s life disorganized the Christian army, and it retreated. The King was beheaded on the spot by a Janissary, and neither his head, nor his body could be saved during the remainder of the battle. Transylvanian voivode John Hunyadi organized the retreat of the surviving Christian forces, with many Crusaders taken captive and sold as slaves. While the Ottomans were ultimately victorious in the Battle of Varna, their losses were so substantial that they did not realize their victory until after three days. The bravery, sacrifice and tragic end of Polish and Hungarian King Vladislav (Wladyslaw) Varnenchik affected the fate of all of Central and Eastern Europe, and made him a hero in the folklore of many European nations.